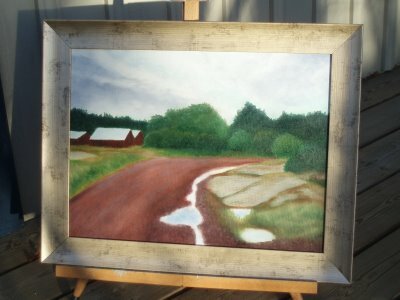 Det här inlägget postades i art, landscape, paintings och har märkts med etiketterna art, landscape, paintings. Bokmärk permalänken. Where does the red path lead beyond the bend? I don’t know where the road leads! The photo I looked at is from Eckero island (in the autonomous province of Aland, Finland). I was not the photographer, and I was not there! I suppose the road goes to the sea, somewhere – east, west, north or south. Or anywhere. Out of time and space, surely. It’s just a piece of art, not the reality. I don't know where the road leads! The photo I looked at is from Eckero island (in the autonomous province of Aland, Finland). I was not the photographer, and I was not there! I suppose the road goes to the sea, somewhere – east, west, north or south. Or anywhere. Out of time and space, surely. It's just a piece of art, not the reality.